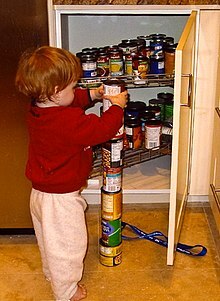 People with Asperger syndrome often display restricted interests, such as this boy's interest in stacking cans. Asperger syndrome is not a disease. People who have it will have to deal with it for the rest of their lives. However, they can try many solutions to help them and learn how to be able to reduce the impact in their life. One solution can be medication to restrict the different symptoms like aggression. The big problem with people affected by Asperger's is that they cannot understand emotions or how people think. Therapists attempt to help the person with that. They will do many activities like acting an emotion and let the Asperger people guess what it is. People with Asperger syndrome can have a hard time "fitting in" with other people. Adults who have it usually learn enough "coping skills" to act in a way that seems normal, but often with a few differences. Most people with the syndrome can communicate clearly with friends and family. They may have more difficulty in communicating with new people. Persons who carries the syndrome, can sometimes seem rude or uninterested during conversations, without actually meaning anything wrong. They may also get stressed or unsettled when things does not go their way. Asperger syndrome is noticeable when the person acts differently in social situations. Their social disabilities can have different levels. It’s not everybody who have Asperger syndrome that have the same level. This characteristic is not the only one. Someone who dislikes people in general does not necessarily have Aspergers. Other characteristics that can be identified are that Asperger people hate any changes in their routine. They also dislike having eye contact. Most of the time they will try to avoid it. They will look away. Usually people who deal with Asperger syndrome have less facial expression than anybody else. There are many characteristics. If someone only has some of these characteristics, there is probably no problem with them. Commonly, people with the syndrome tends to hum or pronounce different sounds to themselves, which they have heard in their surroundings, such as a reporters's voice, a man on the radio, lyrics from songs, words, things they have read, or what people around them usually says. They may repeatedly mention these words or phrases again and again. In the 1940s, a doctor named Hans Asperger studied some children that were different from most other children that he knew, but were like each other. He called them "little professors" because he thought that they were interesting and wrote a book about them. Dr. Asperger thought his "little professors" had a different sort of personality. In the 1980s Dr. Lorna Wing made up the name "Asperger syndrome" for people with high-functioning autism after research into Hans Asperger's work. In 1994 Asperger syndrome was added to the Diagnostic and Statistical Manual of Mental Disorders (DSM-IV). In 2013 Asperger syndrome was removed from the DSM. Asperger's is one of many separate ICD Autistic Disorders that is still diagnosable using the ICD but can be found in the DSM as Autism Spectrum Disorder or Autistic Disorder; and is often referred to as Autistic Spectrum Disorder for clarity. Providers that use the DSM can; document and reference your ICD Autistic Disorder, provide you the additional DSM Autistic Disorder, and or provide a combination of the two labels (e.g Autistic Spectrum Disorder "Asperger's" 299.00 (F84.0), With Specific Learning Disorder, Mild). Asperger syndrome is much more common in males than females. Statistics say that three males are affected for every one female. ↑ The Nemours Foundation. "An Autism Spectrum Disorder", A Children's Health System. ↑ Mayo Clinic. "Alternative medicine", Asperger's syndrome, London, 27 October 2005. Retrieved on 27 October 2005. ↑ "What Is Asperger Syndrome?" -. The National Autistic Society, n.d. Web. 12 May 2014. ↑ Tsai, Luke Y.; Ghaziuddin, Mohammad (1 February 2014). "DSM-5 ASD Moves Forward into the Past". Journal of Autism and Developmental Disorders 44 (2): 321–330. doi:10.1007/s10803-013-1870-3. https://doi.org/10.1007/s10803-013-1870-3. ↑ MedicineNet, Inc. "Definition of Asperger syndrome", Health News of the Week. Wrong Planet designed for individuals (and parents / professionals of those) with Autism, Asperger Syndrome, ADHD, PDDs, and other neurological differences. Aspies Central A friendly community for Asperger, Autism & other associates even for those not on the spectrum. Asperclick A forum specifically for AS, but open to other ASDs.